This page lists plays that I have discovered about Alfred the Great, also music, both specially written, and original. As more are discovered they will be added to the page. Aluredis sive Alfredus, a play by William Drury (1584-1643? ), performed in 1620. In 1659 the play was translated from the Latin by Robert Knightley. Alfred; or right re-enthroned, by R. Kirkham, 1659. Begins with Guthrum's victory over Alfred. The Shepheard and the King (Alfred); and of Gillian the Shepheard's wife, with her churlish answer. (A Ballad), published in 1650?. 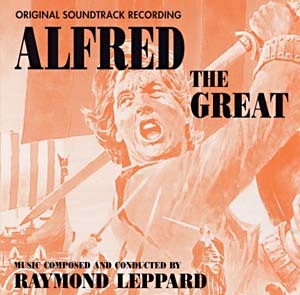 Alfred the Great: A Drama for music, newly written, greatly improved. Adapted by (David) Mallett from the original version by James Thomson and himself. Music composed by Mr. Arne. The work was originally designed as a masque in 1740 and was first performed at Cliveden, country home of Frederick, Prince of Wales, on August 1st, 1740, to commemorate the ascension of George 1st and the birthday of the Princess Augusta. Dr. Arne later revised the work turning it into an all sung oratorio in 1745 and then an opera in 1753. It is best known for its finale "Rule, Britannia!" It was performed at the Theatre Royal , Drury Lane. Alfred the Great, a tragedy in 5 acts. London, 1753. Alfred the Great; deliverer of his Country. A Tragedy....by the author of the Friendly Rivals. Printed for the author and sold by M. Mechell. 1753. The Battle of Eddington, or British Liberty: a Tragedy. London. 1792. The Days of Yore: a drama in three acts, performed at the Theatre Royal, Covent Garden, by Richard Cumberland, 1796. Sketch of Alfred the Great; or The Danish Invasion. A Ballet, with Airs, Choruses. Published in 1797?. Alfred le Grand (Alfred the Great), a Ballet written by Jean- Louis Aumer (1774-1833), in 1820, and scheduled to be performed at the King's Theatre, London, about the 20th February, 1823. A cast list and synopsis appeared in 'The Morning Chronicle' of March 10th, and a lengthy review appeared in the issue of March 12th. Alfred the Great: An Historical Tragedy in Five Acts. by a Young Gentleman of this City [New York]; sold by E. M. Murden, May, 1822. I have no information on an English edition. A play, simply titled Alfred the Great, was performed at the Royal Coburg Theatre, London, on Wednesday February 11th, 1824. The Battle of Eddington; or, British Liberty, a Tragedy in three Acts; written by John Penn of Stoke Park, and produced at the Windsor Theatre, on Thursday 8th January, 1824. A review of the play appears in 'The Morning Chronicle' of Monday January 12th. Alfred the Great; or, The Enchanted Standard. A Musical Drama in Two Acts, by Isaac Pocock, published in 1827; and performed at the Theatre Royal, Covent Garden on Saturday November 3rd, 1827. Reviewed in 'The Standard', Monday November 5th, 1827. Alfred the Great, a Drama in 5 acts [in verse], by Sarah Hamilton, London, 1829. Alfred the Great: or, The Patriot King. A Drama in Five Acts, by James Sheridan Knowles (1784-1862), published by James Ridgway, London, in 1831. The first performance at the Drury Lane Theatre was on Thursday 28th April, 1831, and a very lengthy review appeared in 'The Times' of Friday 29th (page 3). Alfred the Great; a Play in Five Acts, by James Magnus, printed for private distribution by S. Magnus, Fenchurch Street, London,1838. Alfred: A Drama, by the Earl of Ellesmere. Published in 1840. King Alfred; a poem, by John Fitchett (1776-1838). This epic poem was Fitchett's major lifes work. He spent forty years researching and writing it. It was published at Warrington for private circulation at intervals between 1808 and 1834, in five quarto volumes. He did not live to finish the work, but left money for printing a new edition, and the work of supervising it was undertaken by his friend Robert Roscoe. Roscoe completed the poem, adding 2,585 lines. The entire work contains more than 131,000 lines. It was published by Pickering, London, 1841-42 in six volumes, and reprinted in 1844 in two 8vo volumes. Alfred the Great, by Maria Edgeworth (1768-1849), was performed by a party of amateurs, at the residence of Lady Jane Peel, on Wednesday, 20th January, 1841: the back drawing-room had been converted into a temporary theatre for the occasion. Harlequin Alfred the Great; or, The Majic Banjo, and the Mystic Raven. (Anon). This successful Pantomime was performed at the Theatre Royal, Marylebone, on Monday December 30th, Tuesday 31st, 1850, and Wednesday January 1st, 1851, to conclude the show after the performance of Sheridan's Tragic Play 'Pizario'. Alfred. A Patriotic Play, by M.F.Tupper. 1858. Alfred the Great: or, The Minstrel King, by Robert Barnabas Brough (1828-1860), published in 1859. The play was performed at the Royal Olympic Theatre in December, 1859, and reviewed in 'Reynolds Newspaper' January 8th, 1860. Alfred the Great in Athelnay (sic): An Historical Play, by Viscount Stratford de Redcliffe (1786-1880), published by Bernard Quaritch in 1876. A rare book, limited to only 250 copies. Alfred the Great: A Dramatic Fancy, written and arranged by Marcus Clarke (1846-1881) and Henry Keiley, published Melbourne, Australia, in 1879. First produced at the Academy of Music, Melbourne, 24th December, 1878. King Alfred and the Danes: An Historical Cantata, by George A. Mietzke, the words by A.J.Foxwell. Published in 1883. England's Darling, by Alfred Austin. Macmillan & Co, London, 1896. This was the first book published by Alfred Austin (1855-1913), after his appointment as Poet Laureate in 1896, and contained two seperate productions, 'England's Darling', a four act drama about Alfred, whom Austin calls 'the Greatest Englishman', and 'The Passing of Merlin'. Alfred the Great, the Inventive King: An Historical Comic Opera in Three Acts, by F. Edmonds, published in 1897. Alfred the Great: An Historical Comic Opera in Three Acts, by Charles T. West. Published in 1897. Alfred the Great: a drawing room play for children, published by Smith and Smith, 1898. Orchestral Introduction and Chorus in Praise of King Alfred, by George Benjamin Arnold (1832-1902). Published in 1901. Alfred the Great, a drama [in verse], by Edmund L. Hill, published by T. Fisher Unwin, 1901. King Alfred the Great, words and music by T. Facer. Published in 1902. English History Set to Music. No 1. King Alfred in Athelney, by William Seymour Smith. Published in 1902. The Christian King; or, Alfred of Engle-Land, written by Wilson Barrett (1846-1904), and performed by him at the Adelphi Theatre, London, 1902. Alfred the Great: a chronicle play in six scenes, by W.H. Pinder, published by Elliot Stock, 1902. King Alfred: A Sketch, words by E. Conybeare. Published in 1903. King Alfred: A Dramatic Cantata for Soli, Chorus and Orchestra, by Ernest Alfred Dicks (b.1865), vocal score by A. Parsons. Published in 1907. King Alfred's Jewel, by Katrina Trask (1853-1922), 1st UK edition published by John Lane in 1908. Alfred the Great: A Ballad for Chorus and Orchestra, words by Florence Gertrude Attenborough, music composed by William Yeates Hurlstone (1876-1906). Hurlstone composed the music in 1901, but it was not published until 1910. Attenborough's original poem, along with others was published in 1902. King Alfred and the Cakes; An Opera in One Act, by Nicholas Comyn Gatty, text by R. Gatty. Published in 1928. Alfred the Great: A Poetic Drama, by Ralph Barker Gustafson (1909-1995), published by Michael Joseph in 1937. 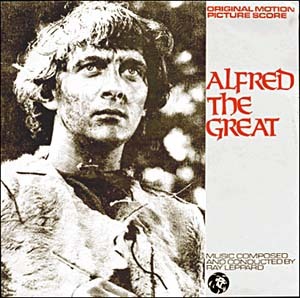 Alfred the Great, original motion picture score, composed and conducted by Raymond Leppard, issued by MGM Records in 1969. Catalogue number: CS 8812. Tracks:- 1. Prologue - Invasion Of The Vikings - Ordination, 2.Alfred Turns Back To The Vikings, 3. First Meeting, 4. The First Kiss, 5. Death Of King Ethelred, 6. King Buhred Deserts Alfred, 7. Queen Aelswith Leaves Alfred - Intermission - Beginning Of Part Two, 8. Aelswith Surrenders To Guthrum, 9. Alfred In The Outlaw Camp, 10. A Night In The Forest, 11. Alfred's Victory, 12. End Title. 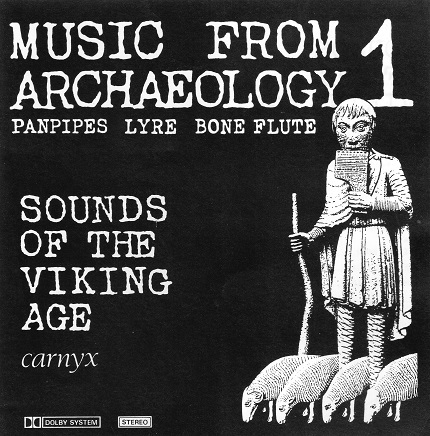 Sounds of the Viking Age, a music cassette produced by Archaeologica Musica, PO Box 92, Cambridge. CB4 1PU, in 1985. Original surviving written music is played on reconstructed instruments, such as the Lyre, Pan Pipes, and Bone Flute. The six pieces on this tape are:- 1. The Watchman, 2. Lamentation, 3. UT-RE-MI, 4. Pilgrim Song, 5. The Nightingale, 6. Come Sweet Love. 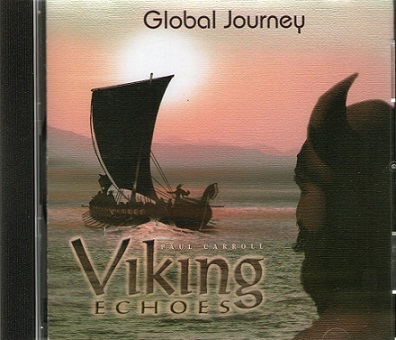 Viking Echoes, a compact disc produced by Global Journey UK, Unit 3, Salford Quays, Manchester. M50 2GN. Modern compositions that aim to transport the listener back to this formative period in European history. Contains 16 tracks. 1. Eric Bloodaxe. 2. Leaving The Homeland, 3. Pirates & Traders, 4. Calm Waters, 5. Work, Rest and Play, 6. Prepare For Victory, 7. Varangian Guard, 8. Aftermath, 9. Lost Souls, 10. The Story Teller, 11. Freyja-Goddess of Love & War, 12. Deliver Us From The Fury, 13. The Battle Won, 14. Betrayal, 15. Burial & Revenge, 16. Epilogue: Life Goes On. Alfredo il Grande (Alfred the Great) is a melodramma serio or serious opera in two acts by Gaetano Donizetti. Andrea Leone Tottola wrote the Italian Libretto, which may have been derived from Johan Simon Mayr's opera of the same name. This opera. with its "highly Rossini-influenced score" was Donizetti's first exploration into British history, but it turned out to be a spectacular failure. It received its premiere on 2nd July 1823 at the Tetro san Carlos in Naples, and this also became it's last performance.